Boeing has unveiled an enhanced projection technology for its Constant Resolution Visual System (CRVS) at the 2012 Interservice/Industry Training, Simulation and Education Conference (I/ITSEC), which is currently underway in Orlando, Florida, US. Developed by JVC Professional Products, the newly launched e-Shift 8K projection technology is designed to enable CRVS to offer four times the resolution of high-definition, for more realistic and effective military training. 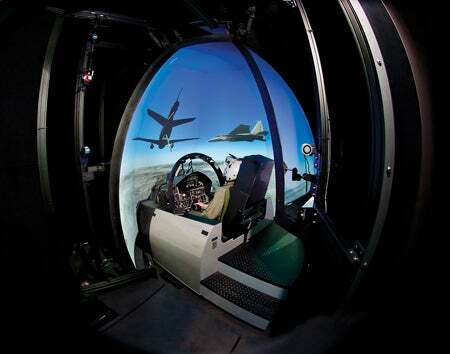 Boeing Visual Systems engineering manager Barry Kuhlmann said: "Now, with JVC e-Shift 8K projectors, CRVS has taken another leap forward in visual performance and fidelity to better prepare military pilots by allowing them to train in a more realistic yet safe environment." JVC Technology Center chief engineer Rod Sterling added: "We designed our e-Shift 8K projector to register down to 1/16th pixel accuracy to provide the unparalleled clarity and sharpness that Boeing customers demand." Bringing CRVS’ visual acuity closer to 20/20, the technology further improves user training experience and also enables pilots to identify a wide range of virtual targets at real-world ranges. The e-Shift 8K projectors are capable of doubling the CRVS projector’s resolution both horizontally and vertically, approaching 8K performance from a 4K device, whilst also keeping them small and affordable. The projector can be easily integrated into existing CRVS systems without requiring modification of screens or its structure. Designed to display visual effects of cities, landscapes and complex combat scenarios, the CRVS’s eggshell-like environment surrounds the pilot and cockpit to provide continuous 360° target visibility. The system is compatible with a broad spectrum of fast jet and rotary-wing cockpits, as well as aviator night vision goggles (NVGs), and also supports easy integration with existing and future head-mounted displays (HMDs). Image: an artistic impression of Boeing’s Constant Resolution Visual System. Photo: courtesy of Boeing.